In 1865 four warriors, including American Horse and Crazy Horse, were made shirt-wearers. Shirt-wearers were young warriors who had proved themselves to be strong, brave, and generous. During a ceremonial feast, each warrior was given a shirt made from the hides of two bighorn sheep and decorated with feathers, quillwork (decoration using porcupine quills or the shafts of bird feathers), and scalps. Although shirt-wearers were not considered chiefs by their people, they were looked upon as leaders. They were expected to lead warriors in peace as well as in war, keeping the peace and respecting the rights of the weak. The 1851 Fort Laramie Treaty set aside an area in northern Wyoming for Lakota hunting grounds. The treaty called for peace among the northern tribes, promised safety to the Sioux, and approved roads and military posts. In 1862, however, Congress passed the Homestead Act in 1862, and three hundred thousand settlers crossed the Plains. In addition, gold was discovered in Montana. In 1862, John M. Bozeman (1835–1867) made a trail across the Lakota Territory. From 1863 to 1864, the Bozeman Trail was the main route to the Montana gold fields. The Lakotas attacked travelers on the trail. This was the start of the Lakota Wars. In 1865, the southern Lakota signed a new peace treaty. When attacks along the Bozeman Trail continued, the government realized the northern Lakota leaders had not agreed to the treaty. The commander at Fort Laramie was ordered to have all Lakota sign a new treaty in 1868. The Fort Laramie Treaty of 1868 promised that the Lakota, Cheyenne, and Arapaho groups could travel the buffalo grounds of the upper Missouri as long as the buffalo herds survived. The treaty also required their children to attend Christian missionary schools and promised that Fort Phil Kearney would be burnt to the ground. agreed to move their people to reservations. Others, including Sitting Bull (1831–1890), American Horse, and Crazy Horse, refused. In 1874, while on a scouting mission in the Black Hills, Lieutenant Colonel George Armstrong Custer (1839–1876) discovered gold. This discovery brought a new wave of miners into the Black Hills. 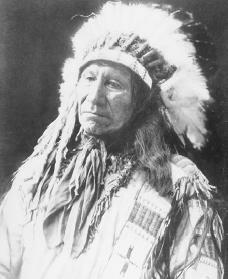 A Senate commission then met with Red Cloud and other chiefs and offered to buy their land. Seven thousand Lakota came to a special council meeting in September 1875. Red Cloud said he would not accept payment of less than seventy million dollars and beef herds to last seven generations. Others called for war and vowed to protect their sacred land. In December 1875, in the middle of a bitter Plains winter, the U.S. Interior Department ordered all Sioux to the Dakota reservations. Those who did not report by January 31, 1876, would be considered hostile. Because it was winter, when no one moved around on the northern plains, the Indians remained where they were. Unfamiliar with the area and the tribal customs, the Interior Department ordered the military to drive the Lakota onto the reservations. General George Crook (1828–1898) led his troops to the region to carry out the military's orders. On March 17, 1876, a group of Crook's soldiers surprised a small Lakota camp, destroying all the tepees and winter food stores. The following month, Sitting Bull held a council to talk of war. As Sitting Bull prepared for war, many of the reservation Indians joined him. There were several minor skirmishes between soldiers and Lakotas before summer that year. By June, the Indians made camp at the Little Bighorn in the Bighorn Mountains. Depending on who tells the story, either Custer surprised Sitting Bull's camp or Sitting Bull ambushed the Seventh Cavalry. Whichever version actually occurred, 189 soldiers, 13 officers, and 4 civilians died on June 25, 1876, at the Little Bighorn, according to official military records. Hundreds of warriors had overwhelmed the Seventh Cavalry. After their victory celebration, Sitting Bull's forces broke into smaller groups and began their summer buffalo hunt. General Crook and other military leaders began searching for the Sioux. By September 1876, Crook's troops had run out of supplies. He sent a small group of soldiers, led by Captain Anson Mills (1834–1924), for supplies. Mills's scout found signs of a Lakota camp, and on the morning of September 9, 1876, the soldiers stampeded the tribe's horses through the sleeping camp. A private saw Custer's Seventh Cavalry guidon, or pennant, hanging on American Horse's tepee. Mills's troops also found uniforms, guns, ammunition, a letter addressed to a Seventh Cavalry soldier, and other supplies. This was considered proof that American Horse had taken part in the Battle at the Little Bighorn in June. Later, other Lakota said American Horse had not taken part in Little Bighorn and that these things had been brought into his camp by other Native Americans. No historical evidence has ever been found to prove American Horse took part in the Little Bighorn battle. When the soldiers attacked, many Lakota escaped into the surrounding bluffs and started firing back. A small group of Lakota managed to kill some of Mills's pack mules and held off the soldiers from inside a gulch. Mills sent a message to Crook asking for help. After two hours of exchanging shots, Crook ordered the shooting stopped. Thirteen women and children surrendered. Crook asked the women to return to the gulch to tell the remaining holdouts they would be treated well if they surrendered. A young warrior helped American Horse out of the gulch along with nine more women and children. Two warriors, one woman, and a child were left behind, dead. Cyrus Townsend Brady in The Sioux Indian Wars from the Powder River to the Little Big Horn said, " Even the women had used guns, and had displayed all the bravery and courage of the Sioux." American Horse had been shot in the gut. When he came out of the gulch he was holding his wound and biting down on a piece of wood to keep from crying out. He handed Crook his gun and sat down by one of the fires. American Horse died that night. It was the first of many defeats for the Lakota. In Crazy Horse: The Strange Man of the Oglalas, Marie Sandoz reported that American Horse said, "It is always the friendly ones who are struck," before he died. Other writers indicate American Horse said nothing before he died. In any event, American Horse is remembered as a brave Sioux fighter and leader who defended his people, the land, and the Sioux way of life. Biographical Dictionary of Indians of the Americas. Newport Beach, CA: American Indian Publishers, 1991.